Yolanda Gampp started her on-screen baking career as a cast member of Food Network Canada’s Sugar Stars. The show, the brainchild of production duo Connie Contardi and Jocelyn Mercer, featured Gampp and her co-stars as they produced elaborate cakes and themed tables of goodies for special events. But the trio faced disappointment when Sugar Stars was canceled after one season in 2012. Contardi and Mercer spent the next couple of years pitching new show ideas featuring Gampp and her talents, but networks didn’t bite. It was then that the three Toronto-based women decided to forego television and launch their own show on YouTube. That show is How to Cake It, where Gampp channels her 20 years of experience into making cakes that look like all sorts of foods and everyday objects, from a baked potato to a fidget spinner. In the past two and a half years, How To Cake It has garnered more than 3.6 million subscribers and 332 million views on its main channel and expanded to a secondary channel, How to Cake It Step by Step, in 2017. Gampp, Contardi, and Mercer envisioned How to Cake It as a digital brand “with YouTube at the heart,” and with the help of five additional full-time employees and three part-timers, the team maintains a website, blog, e-commerce offerings and social media accounts. 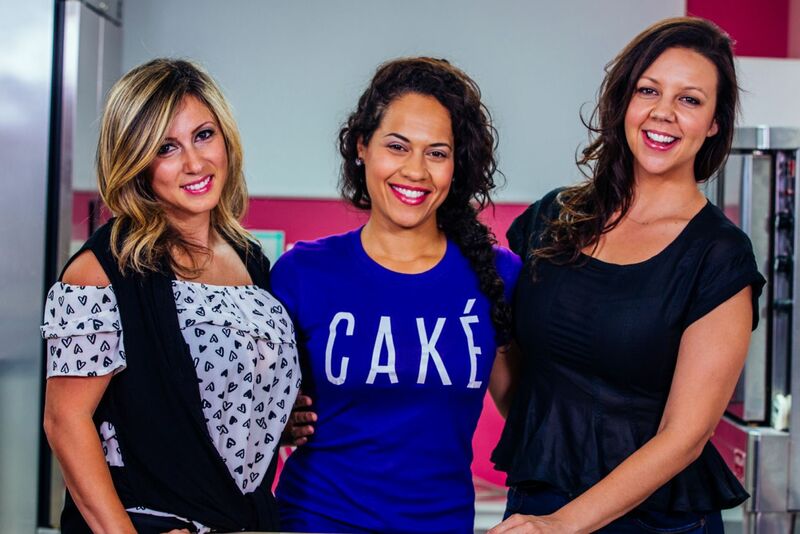 Entrepreneur spoke with Gampp, Contardi, and Mercer about their vision for How to Cake It and how their approach differs that of other on-camera cake-decorators, YouTubers and women entrepreneurs generally. Mercer: Connie and I have been business partners for about 11 years. Our background is in television — factual television, specifically. Sugar Stars was our introduction to Yo’s incredible talents and her wonderful personality, so after becoming friends and staying in touch, Connie and I decided to make our exit from television and entry into YouTube, where we could stop asking permission and make a show that we really believed in. We were really excited about the opportunity to have our own creative voice. We all wanted to create a channel that displayed Yolanda’s incredible cakes. At the time, there wasn’t a lot of baking channels that were entertaining. They were very tutorial focused, on the A-to-B of the cake. Gampp: The only thing you don’t see in our videos is the baking of the cake and when I make the buttercream. Other than that, it begins by removing the baked cakes from the pans all the way to the end of the cake. We film the entire process, which takes days — anywhere from two days to four days. That’s how long cakes take in general, but with filming, we have to pay attention to capture every single thing so we can illustrate to the audience how I did it. There’s no time for practice unless I’m willing to give up the rest of my life. Even if I did it before, the second one would never look like the first one, because I’m making these cakes by hand and they’re all original, even if it’s the exact same object. Mercer: We have one shooter in the kitchen with Yo for the duration of the cake, and the process is all done with Yo and that person, who has to be, obviously, very patient and very good at working with her for days at a time on this one cake. We shoot the narrative separately, so that’s another couple hours of us sitting down and doing an interview. Then we also have the editing, which takes two to three days per video. In terms of production efficiency, we’re probably one of the least efficient channels. 3. What’s your content strategy? How do you decide what and when to post? Mercer: We decided on Tuesday at 11, based on research that we did, and we have never changed that. Consistency is probably the biggest key to YouTube. Our three pillars are collaboration, creativity, and consistency. People are like, “There’s gotta be a deeper secret,” but that’s the secret! It’s a very simple one, but a very difficult one to maintain. We’ve never missed a Tuesday video at 11, and we don’t plan to, knock on wood. With social, you can change the times of our posts without fans freaking out, but on YouTube, they expect that. Contardi: It’s also about being consistent with the brand voice and the type of content we’re putting out. We’ve tried to do other things, like we were experimenting with YouTube Live last year, showing a little bit more behind the scenes. And while our superfans really loved and appreciated that behind-the-scenes content, it just wasn’t tracking the way our typical Tuesday video does. It’s important to stay consistent and find other ways to test different content. We’ve started a second channel, How to Cake It Step by Step. We’re finding that that’s more effective than trying different content on the main channel. Mercer: Another big part of the strategy is surprising. Yo’s cakes, in nature, are surprising, because they are cakes that look like real things. It’s not just surprising that they look realistic, but it’s also surprising in how she makes them. It’s about inspiring people, making them laugh and keeping them on their toes. Contardi: There are a lot of different aspects or elements that make up our business model. The heart of our brand has always been and will probably always be YouTube, so we monetize through the traditional ways of monetizing on YouTube, such as the ad sales. We do a lot of great brand deals. Yolanda can pretty much make a cake of almost everything — there are a few limits. So it’s a great, organic way to work with brands. For example, Yo made an ice cream sandwich cake for a Baskin-Robbins collaboration. From day one, we’ve had our own e-commerce platform. We sell everything that would make baking more fun or would really help people with these caking skills. There are a lot of community members of ours who watch the videos, and for every video we put out, there’s a blog post on our website. We offer them the physical tools, anything from spatulas to a simple syrup bottle, who’s been nicknamed Sir Squeeze. And then we have fun with it. In every video, Yo wears a cake-themed T-Shirt, like one that says “99 Problems But a Cake Ain’t One.” We’ll sell certain T-Shirts on the site as well. The live stream baking camp and the book are revenue sources as well. Outside of just monetizing, we try to leverage How to Cake It to talk about issues that really matter to us. We’re proud to be a female-run company that’s working through collaboration. The media likes to sell the story of the woman who does it all. We like to talk about how that’s cool if you do that, but there’s probably a high price to pay to do that, and there’s another option. Gampp: If you’ve ever watched a cake competition, there are always other things to help the cake. The bigger a cake gets, or the more top heavy it is, you have to introduce Rice Krispies, plastic piping, nuts, and bolts or wooden bases in order to stop gravity from doing her thing, which is almost impossible. I want to make cakes on the channel that people can actually attempt. You, in your house. I mean, that’s where I started — I made cakes in my mother’s kitchen. If I am going to make a six-foot-tall cake, you better believe we’re going to be filming for six days. It’s not attainable or sustainable to make gigantic cakes just for the sake of saying they’re gigantic. In reality, a lot of those cakes aren’t even that fun to cut or don’t end up having that much cake inside because of the way they’re built. Mercer: Understand it’s a long game. We were joking recently, if we knew what would go into building this at the time, we’d all look back and go, “Whoa!” Sometimes if you knew how much work something was, you may not do it. But we’re so happy we did. People getting into it need to know that and need to be ready for the ride and be passionate about what they’re doing. Otherwise, you’re not going to have the motivation you need to keep going when it gets really hard. Figure out what you love doing, whether the cameras are rolling or not. Yo is doing this regardless — whether we were filming, not filming, whether we had found her or not, whether we’d all ever met. Yo would still be making cakes. 7. What’s a misconception many people have about YouTube? Contardi: People look at YouTube, and I think they think that it might be easier than running another type of business. But you’re managing people, there are lots of hours, paperwork, administration, numbers — so it is like any business. Gampp: I have little kids coming up to me and saying, “Why did you choose to make cakes on YouTube?” They think my goal was to be a YouTuber, and the cakes were secondary. There’s this facade about YouTube that, for some reason, it comes across as being simpler than the other choices. I’m not sure way. YouTube doesn’t have seasons. It’s constant, and you have constant communication with your viewers, so you’re able to tweak as you go along, which is a great thing, but it’s also really hard to keep up with. Contardi: People think it’s easy money. That you put up a video, and that your bank account starts, I don’t know, filling up or something? It’s like any job. You have to work hard, you have to be consistent, it’s not always what it seems. Mercer: That, and people think it’s Yo doing this all by herself. Gampp: Everybody knows that TV shows and movies are made by a ton of people. On YouTube, there are one-man shows that grow to a point where they physically can’t do that and they are forced to collaborate or hire people they trust to help them run their channel. The bigger your channel gets, the bigger your team gets. Where we’re lucky is, we started there. For us, we’re on all platforms. It’s our website, our blog, our e-commerce, our Instagram. It’s all of these things, and if you really think about it, there’s no way one person could be doing all of that. See below for the How to Cake It team’s picks of five videos that they believe represent their brand. Mercer: It’s our biggest video. It was also very serendipitous. Having a watermelon with a face was very in-the-moment, authentic. Our camera guy loves drawing, and we all just thought it would be hilarious. It wasn’t our intention to have the watermelon have a voice, but after we shot it, the footage went off to our editor, and I took a look at the cut and saw that he’d inserted these lines for the watermelon. I remember just dying of laughter and calling our texting Yo and Con and being like, “Guys, this is either going to ruin us, or this is going to be amazing.” We all just agreed, let’s do this. It makes us laugh, and maybe it will make other people laugh. Gampp: That’s the beauty of YouTube, where you have the freedom to do those things. In TV, you’d never be able to just come up with something on the fly and put it out there like that, so I think that’s what’s wonderful for creators, is you get to flex those creative muscles, and you’ll know right away, directly from your audience, if they love it or hate it. I also don’t always have the belief that I can do what I’m going to do. I just know that I’m going to try my best. It came out better than I thought, and it was such a fun process. Mercer: It was such a surprising cake to make. It was ooey and gooey and gory. That was the first gory cake, so that was a nice little surprise, and it sort of woke our audience up. Mercer: Looking at our back end, that’s still one of our most-viewed episodes. To me, it just feels whimsical. It very much feels like who we are: whimsical, big, over the top … it’s one of those excessive, dream desserts, which is the vibe we always try to evoke. Mercer: That was a fan request. That was highly requested by our fans like, ever. Finally, we did that, and Yo killed it.